My first crock-pot was a Christmas gift from my friend Noreen who had just discovered I didn't yet have one. Now I wonder how I ever got along without it. Crock pot cooking does require me to somehow find ten minutes in the morning to get everything going. But, oh, the rewards of those few extra minutes. 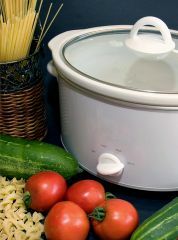 I'm on the verge of a smile throughout the day when thinking about my hot, homemade dinner bubbling in the crock pot back home. The thought makes even my sandwich at lunch taste better. And then--how can I explain the delicious aroma that greets me as I walk into my house. It's like a warm, welcoming hug that says, "Dinner's ready!" Get out your vinegar bottle! It's a budget-friendly ingredient for healthy recipes, and you'll need it. For more great food recipes, check out cooks-cozy-kitchen.com to make-your-tummy-happy with good foods from excellent choices in home cooking!